Obituary for Paulette "Polly" McEathron | Résidence Funéraire Fawcett Funeral Home Inc. The family announces with sorrow her death at the Geraldton District Hospital on November 14, 2018 at the age of 67 years. Beloved wife of Leonard McEathron and dearest mother of Shelley McEathron of Thunder Bay, Kimberly McEathron of Geraldton and Joseph McEathron of Geraldton. She is also survived by her brother Allan Woodcock of Niagara Falls, ON, her sister Lorraine Wannamaker of Bancroft, ON and her brother Wayne Woodcock of Belleville, ON. She will be sadly missed by her 4 grandchildren and 3 great grandchildren. 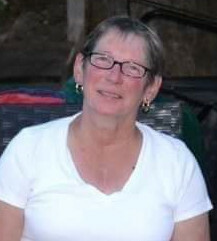 She is pre-deceased by her son’s Kelvin and Jack and her granddaughter Kelley-Ann McEathron. Paulette was born in Toronto and was raised in the Coe Hill area. She met and married Leonard, in Coe Hill. They began their life together in Peterborough where they had their children before moving to Geraldton where she started a new life as a stay at home mom. When her children became of school age she became a chamber-maid and then became a waitress where she met many wonderful people. Some of those who became part of her ever loving family. Her hobbies were fishing, camping and spending time with her family and friends.